When I first starting sewing, I thought patterns were for pansies. Whenever I did use one, I figured I knew what I was doing, and didn’t bother with the directions or envelope information. I was a dress size 6, but when I cut the pattern size 6 out, it was always too small. When I finally realized that pattern sizing is not the same as dress sizing, I still didn’t use the right seam allowance, so then my pieces were always too big. The point I’m trying to make is that the directions and the information included with your sewing pattern are a HUGE deal. If you’re not going to learn how to read and understand them, you’re better off not using them in the first place. To save you from the disasters of my past, I’m here to teach you how to read a sewing pattern–specifically the envelope. You might be surprised to find out how much information there really is on the tiny paper packet. The front of your pattern envelope contains a preview of what you can make and a few different ways it can be styled. You are, of course, free to pick whatever fabric or print you like, but sometimes the covers can be very inspiring. 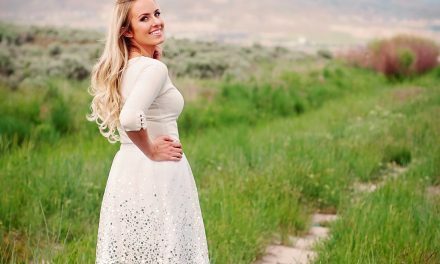 When I saw McCall’s M7537, I knew I had to make the white dress with the black trim (see below). The front also tells you the company, brand, and/or designer that created the pattern. It will also list the sizes within the envelope. It’s important to remember that pattern sizes ARE NOT the same as dress sizes. Also, the same pattern is often made in two different size series–meaning one will have the 5 smaller sizes, and the other will have the 5 bigger sizes–but they will look EXACTLY the same other than the size numbers being different. I can’t tell you how many times I’ve forgotten to check that I have the right size. Next to the sizes, there’s often a code like AX5, A5, BB, B5, OSZ, or Y. These are just the names of different size combinations. For example, A5 is pattern sizes 6-8-10-12-14. I usually just ignore these, and look at the actual sizes instead since I haven’t taken the time to memorize these codes. 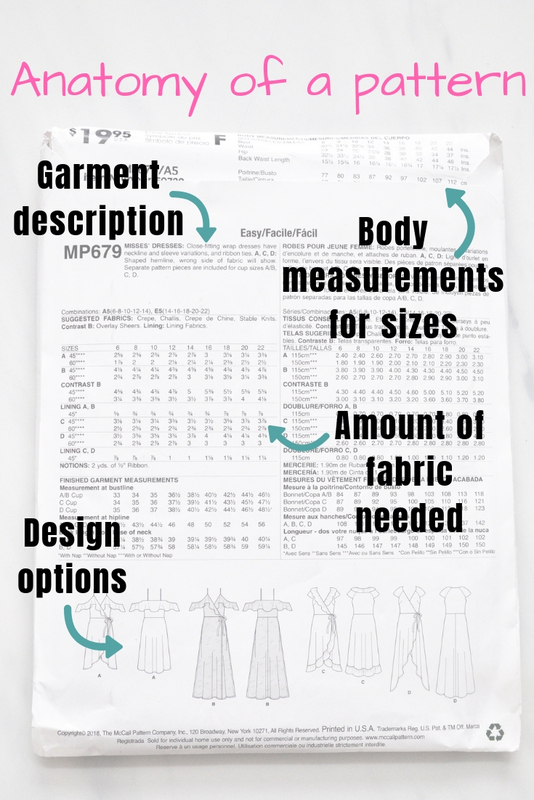 And if you’re confused, remember that the measurements of each size are found on the back–more details on how to find your pattern size in the next section. 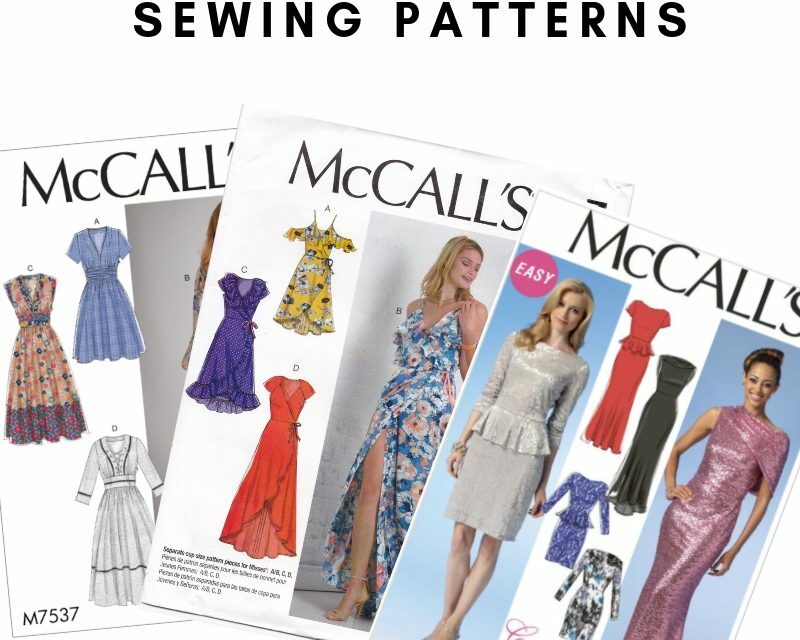 You’ll notice that most patterns have a letter next to each style option, these letters will be used on the back of the envelope to help you identify how much fabric you will need for a specific style. Finally, most patterns have a name or assigned number. I’ve found that searching that name online can show you what other people made using that pattern. You can also use the hashtag symbol before the pattern name to search what people made on Instagram. For example, for McCall’s M7537, you can search #m7537 to see what others have made. The back of the pattern envelope can be overwhelming to a new sewer. Why are there so many tiny numbers? What do these measurements mean? What are notions? 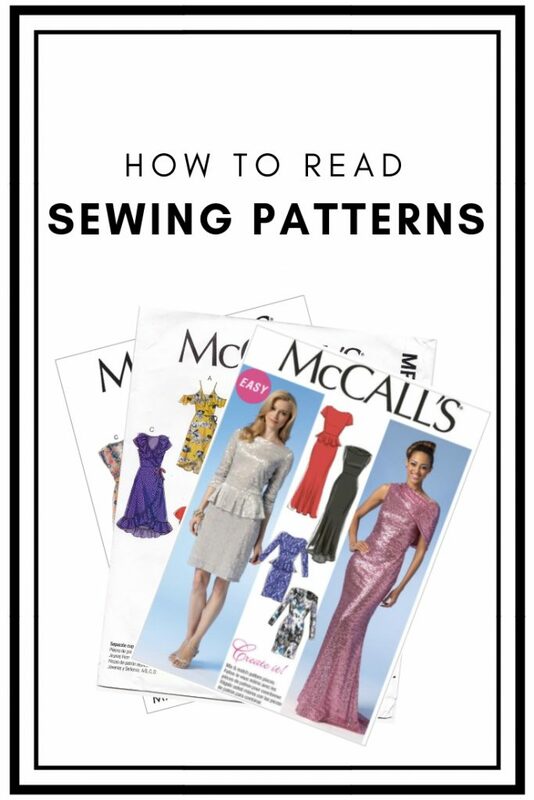 The truth is, it only takes a little bit of practice to learn how to read a sewing pattern, and once you do, you’ll be so thankful for how helpful they are. The most important information on the back is the pattern sizing. In American patterns, you’ll often find it on the flap. It will record the measurements of the bust, waist, hip, and back waist length in inches. 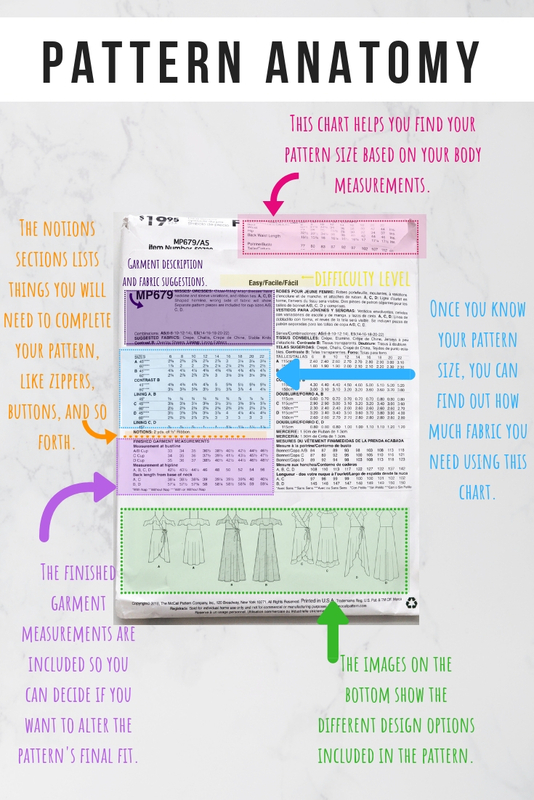 Once you’ve measured yourself, find the column that closest fits your measurements, the number at the top of your size column is your pattern size–it will be a bigger number than your ready-to-wear size. There’s also a garment description towards the top that gives you a few details about the piece you’ll be making. Right below you’ll find the suggested fabrics. While you can always select whatever you want, it can be very helpful to pay heed to the suggestions as the drape, weight, and stretch of fabrics plays a tremendous role in both construction and fit. The most intimidating part of a pattern is the fabric measurement section. The numbers can be overwhelming, but no stress, I got you girl! Most bolts of fabric come in either two widths–45″ or 60″ (54″ is also common, but not usually on pattern envelopes). So on the left hand side of your pattern, you’ll often have a row for 45 inch wide fabrics and a row for 60 inch wide fabrics. This is important because you’ll usually need less fabric if buying from a 60 inch bolt than a 45 inch bolt. To find how much fabric you need, locate the piece/pieces you are making like “skirt” or “sleeved bodice,” then select the width of the bolt of fabric you are using, and find where that intersects with your pattern size column. The resulting number will be in yards if using American patterns, or meters if using European patterns. There will usually be a few images depicting what you can make with the pattern included. This is helpful in determining what style you want to make and how much fabric you’ll need to do it. You can often play around with these, like adding the skirt of one style, to the bodice of another. The word “notions” is sewing-talk for “other things you’ll need besides fabric and thread.” It often includes items like zippers, buttons, elastic, and how much you’ll need of each item. Don’t forget this section because it’s never fun to have to return to the fabric store mid-project because you forgot to pick up your invisible zipper. These numbers show the measurements of the final piece if you follow the pattern. This can be helpful if you are between sizes and are trying to pick one, or if you want to know how long a skirt is, ect. 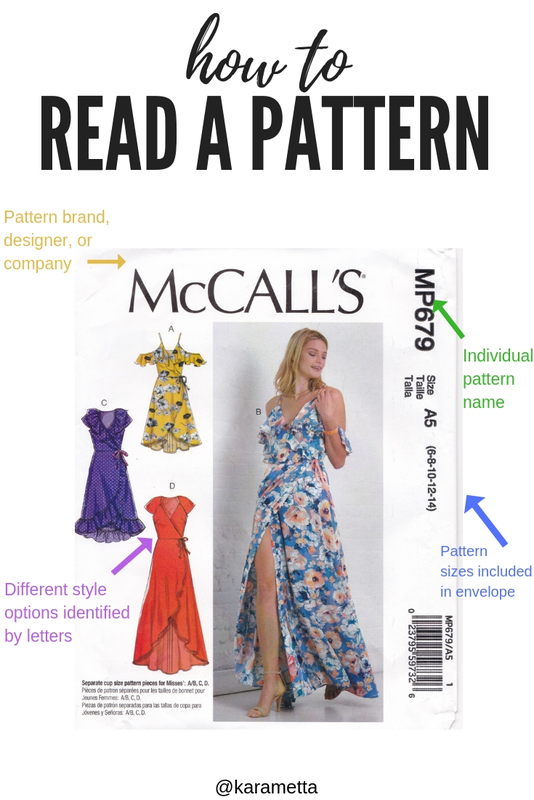 If you are a beginner, I recommend looking for patterns labeled “Easy,” “Beginner,” or “Learn to Sew.” This will help you work with patterns that won’t prove to be frustrating for your skillset. Have any other information or tips about patterns you’d like to share? Please comment below! Feel free to ask questions as well!